As you can see I'm ever so close to finishing that second sleeve, I think it's about 4 rows of knit stitches plus 12 of ribbing and then all that's left is the collar. I'm rather dragging my heels over it at the moment, I think I'm a little daunted by the collar which is daft. I've added a few more rows to this crochet project. I've been trying hard to vary the colour combinations but this is getting much trickier now. Hopefully I can keep it looking fairly balanced. It's a nice project to dip in and out of as I'm in no rush to finish it. Plus being mostly dc stitches using a 3.5mm hook it's not exactly speedy! These are coming up to needing to do the heel so I've not been knitting much on these either. There's a lesson there somewhere... I think I just need to make some time to sit down and concentrate on getting things done. I'm itching to cast on a new shawl now the weather is a little cooler. I've got the yarn wound and the beads all ready, I just need to decide which pattern I'm going to use. Oh and finish the sweater because I need those needles! 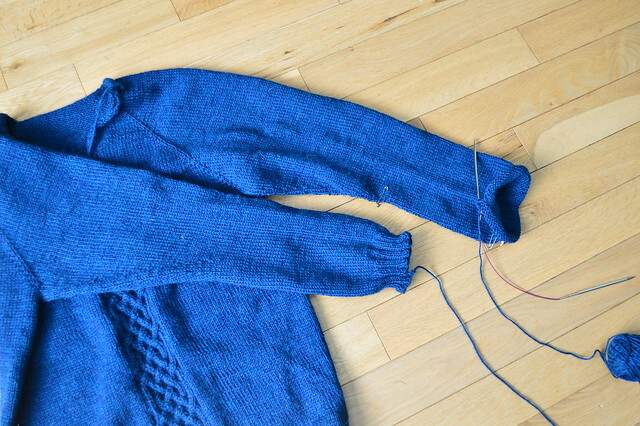 Love the vibrant blue in the sweater- all the happy colors you chose for your projects! I like the sweater's color, too! Everyone has their knitting pauses. You're close to finishing though! Mine usually pause further from the end! won't be long before that sweater is being modeled by you know who!! Can't wait! Oh your sweater is going to be splendid, the collar won't be any way near as bad as you think it might! 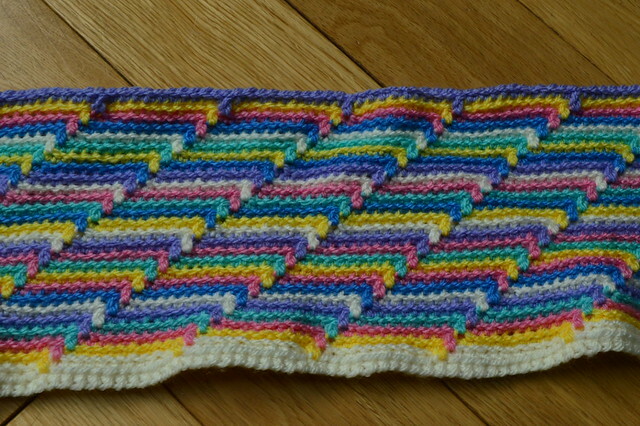 Love your crochet, such gorgeous colours. Seeing this projects always make me smile. You are patient knitting a gansey for the hubb and also working on a blanket while trying to vary color sequence. I love all your projects. I know what you mean about sitting down and just finishing things. At least you don't seem to have the same problem with startitis that I do! Your sweater is coming along really nicely! Can't wait to see it finished! I love how all your projects are full of color! Really like those cables in the piece. 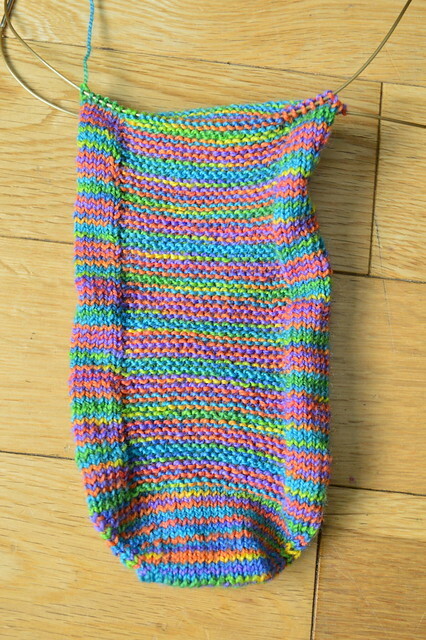 Very pretty color and you are sweet to put all that time in the kiddo's sweater.